Batiste is an absolute beauty must have. Honestly, If you don't have this in your hair collection you should rethink your routine! I find it an absolute lifesaver, I use it to revitalise greasy hair, or when my hair is just washed and needs a little "dirt" to aid styling. I like Batiste Tropical and Batiste Oriental, but it comes in a wider variety of scents to suit any taste. This work just as well if not better than high end dry shampoo's in my opinion. 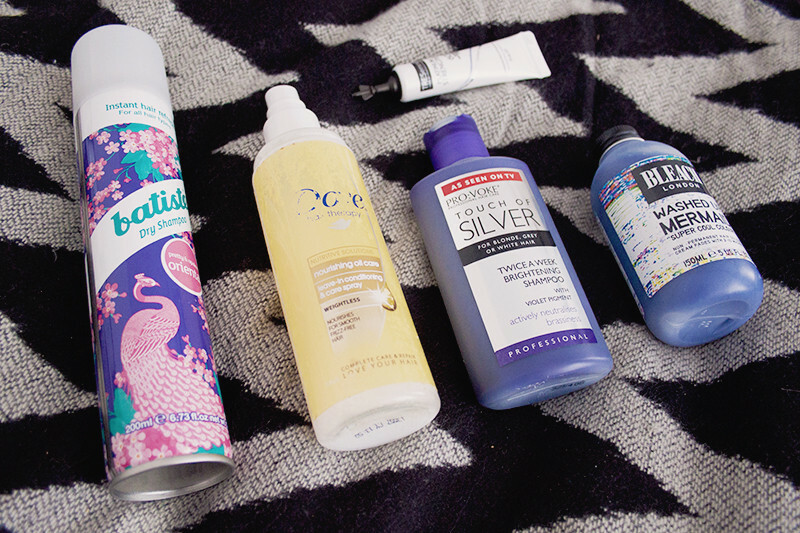 One of my haircare secrets include the little TRESemmé Platinum Strength Monodose. Nifty 60 second hair masks which adds an intense boost of nourishment, shine and softness to the hair. I love them because they are a brilliant quick fix. After using one of monodoses on my tips and working up to my mid lengths, my hair feels transformed. Perfect to use inarush or when your in the shower to perk up your hair. I like all the TRESemmé Platinum Strength range, but they do start to go up in price after this one. I'd really recommend the Deep Conditioning mask as well as the Leave in Conditioner. If you're a blondie like me, then a purple shampoo is a must. I always opt for the Pro:voke Twice A Week Brightening shampoo to knock out any of the brassy tones in my hair. I tend to use this every other wash as my hair goes brassy very quickly. As I do find it a touch drying, I always mix it with another shampoo for added hair are benefits. The packaging is a bit old fashioned and it looks like something my Nan would use…, but I can't knock the fact it works. I'm always raving about the Dove Nourishing Leave in Conditioner, it's my go to detangling treatment. I use it between washes to add a little something to my dry damaged hair without making it feel greasy or weighed down. I adore the scent, and it's light enough to be used on a daily basis. I adore this and have gone through countless bottles of the stuff, and I even have a backup or two lurking in my cupboard. I decided to also include the new Bleach Super Cool Colour's in my top 5 for under £5 edit. Recently launched these at home crazy hair colours have quickly rocketed up my list of favourites. Coming in 12 different shades and lasting 2-10 washes depending on your hair colour. There is something for everybody, and I love that I can now pop into my local Boots store and go a little crazy with the hair dye. My picks are Rose, Washed up Mermaid, Awkward Peach and Seapunk! I'll be reviewing these in full sometime next week, but honestly, I can't fault 'em. Bleach sure know their hair dye. What are your favourite hair products under a fiver?